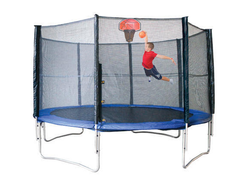 Exporter of a wide range of products which include kids trampoline. Kids Trampoline it is made by GSD company and import by us and sale in India with our on brand name JUMPING STAR. Available Sizes: 6ft , 8ft, 10ft, 12ft, 14ft & 16ft Kindly contact for wholesale supply. Looking for GSD Kids Trampoline ?